Naturally, the South Park boys will treat you differently if you play as a girl. In South Park: The Stick of Truth, you played as the "new kid," a boy who has just moved into the town of South Park. While there were quite a few customization options, gender was not one of them. Creators Matt Stone and Trey Parker explain that this was due to a side quest in the game, where you are tasked with infiltrating the "girl" faction. 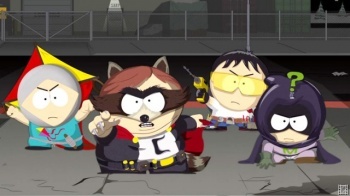 In The Fractured But Whole, the player character will be able to be a girl, although this will have some consequences on the way the other characters treat you. In Stick of Truth we got halfway through the game, and we had narratively come up with the big Girls' Quest halfway through it. [The Girls] were a faction in the fantasy world. And then someone's like, "What if you want to be a girl?" Narratively, it didn't work. We'd have to sh- can the whole game. So we just left it the way it was. This time, we obviously wanted to add that. But the boys are little boys, because it's really a story about little boys running around. So they don't care about [your character being a girl]? That seems weird. They always seemed to care about it in the show. Are they dumb about it, and they don't know? So you're in hiding? Or do they totally care about that, and totally treat you differently? So we ended up doing those things differently for different characters. It actually turned out to be quite a bit more work. I'm also playing The Division - I'm not just saying that because it's Ubisoft. I made the character look like my wife, just because I thought that was funny, running around New York shooting people looking like my wife. But the game doesn't treat you that differently. The guys still shoot you. The game doesn't really react that much differently. That's cool for that kind of game. It's been a funny journey to go through, introducing something that we thought would just be a cool feature. You're a girl! But now they're going to treat you different. South Park The Fracture But Whole will be released for the PC, PS4 and Xbox One on December 5, 2016.